Camp Member & 5th Brigade Councilman Don Green presents a Certificate of Commendation to Tim Cupit - Commander of the Rankin Rough & Readys Camp of Brandon, MS. at the 5th Brigade Meeting on December 9, 2011 for his presentation of the Division Reunion to take place June 8-10, 2012 in Brandon, MS. This photo was taken at Carl Ford's Office under his sign after the Laurel, MS. Christmas Parade from the morning of December 3, 2011. Participants of the 27th Mississippi Honor Guard are: (Front Row Kneeling From L-R) Don Green (Camp #227), Larry Higginbotham (Camp #1956), Doug Jefcoat (Camp #227), Billy Langley (Camp #227), Dennis Avera (Camp #227). (Back Row Standing From L-R) Andy Salassi (Camp #227), Cotton Norris (Camp #227), Joseph Dawson, George Jaynes (Camp #227), Reed Walters (Camp #227), Joe Cosper (Camp #227), Ronnie Mitchell (Camp #227), Sam Calvin (Camp #1353), Patricia Salassi. This photo was taken in Petal, MS. before the Petal Christmas Parade in the afternoon on December 3, 2011. Participants of the 27th Mississippi Honor Guard are: (Front Row Kneeling from L-R) Don Green (Camp #227), Larry Higginbotham (Camp #1956), George Jaynes (Camp #227), Dennis Avera (Camp #227). (Standing From L-R) Sam Calvin (Camp #1353), Eric Hartfield (Camp #1956), Joseph Dawson, Joe Cosper (Camp #227), Ronnie Mitchell (Camp #227), Not Pictured- Hugh Draughn (Camp #1956). Camp #227 held it annual skirmish at Landrum's Homestead and Village on Saturday November 26, 2011 as part of the Christmas Celebration and Open House. Pictured are: Reed Walters (Camp #227), Ronnie Mitchell (Camp #227), Doug Jefcoat (Camp #227), Billy Langley (Camp #227), Mike Merritt (Camp #1956), Carl Ford (Camp #227), Joe Cosper (Camp #227), Dennis Avera (Camp #227), Terry "Beetle" Bailey (Camp #11). Not pictured are: Don Green, Coco Roberts and George Jaynes, all of Camp #227. 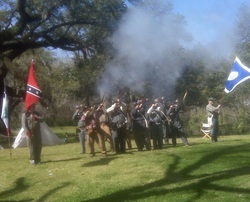 Camp Members Joe Cosper and Don Green participated in the Camp Moore Reenactment near Tangipahoa, LA. on November 20, 2011. Camp #227 assisited the local DAR chapter with a Halloween Tour of the Deason House located in Ellisville, MS. on Saturday October 29, 2011. Shown above is the Confederate encampment next to the house. Members of the Rosin Heels Camp Doug Jefcoat, Joe Cosper, Ronnie Mitchell and Dennis Avera fell in with the 46th Miss. Inf. 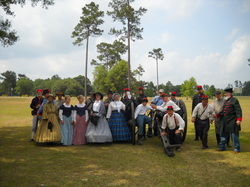 at Fall Muster down at Beauvoir in Biloxi, MS. on Saturday October 15, 2011. Camp #227 Member Don Green poses for a pic at Fort Mims near Stockton, AL. on Saturday August 27, 2011 with Camp #1956 member John Petifils, Camp #11 member Terry "Beetle" Bailey and Camp #1864 member David Kralick. Also pictured are Johnathon Kobler and Ken Mcghee. 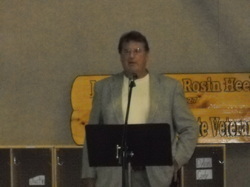 Noted author and historian, Dr. Thomas DiLorenzo was the keynote speaker at the Southern Heritage Conference held August 5-6, 2011 at Bethlehem Baptist Church in Laurel, MS.
Camp #227 Member Joe Cosper fell in with the 2nd Miss. Inf. 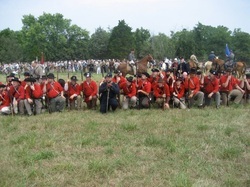 Co H at the Nat'l Reenactment in Manassas, VA. on Saturday July 23, 2011. 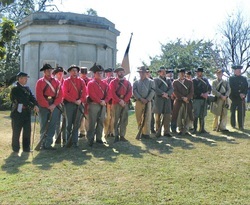 Camp Member Don Green participated in a memorial for Major George Litchfield, 7th SC. Inf. Co. L in Bay Minette, AL. on Saturday July 16, 2011. 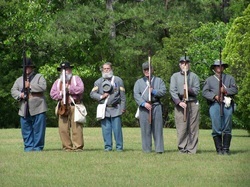 Camp Member Don Green participated in the Lewis Memorial near Pensacola, FL. on June 11, 2011. Pvt. 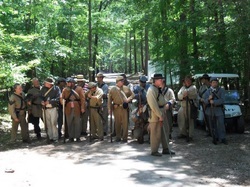 Lewis was in the C Company of the 15th Confederate Cavalry. One of Don's ancestors, Capt. W. B. Amos commanded Co. 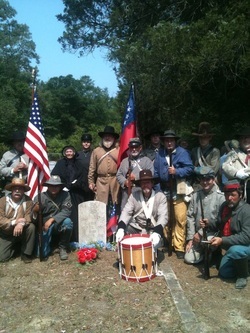 I of the 15th Confederate Cavalry. 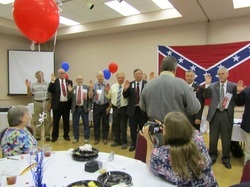 The new SCV Mississippi Division Officers get inducted at the Division Reunion held in Gulfport, MS. June 3-4, 2011. Members of Camp #227 Dennis Avera and Joe Cosper fell in with the 18th Ala Inf for the weekend at the Tannehill Skirmish at Tannehill State Park near McCall, ALA on May 28, 2011. Camp Member Don Green participated with other SCV Camps from 2nd Brigade to dedicate 65 crosses for CSA Soldiers near Splunge, MS. on Sunday May 22, 2011. 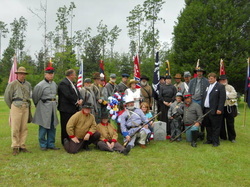 Camp Member Don Green took part in the Marker dedication with the Gainesville Volunteers Camp #373 for the 38th Miss. Inf. Co. C "Hancock Rebels" on Saturday May 21, 2011 at the I-59 rest area in Picayune, MS. The Rosin Heels Camp helped to make up the 27th Miss. 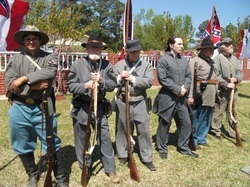 Honor Guard at the Stringer Memorial north of Taylorsville, MS. on May 14, 2011. 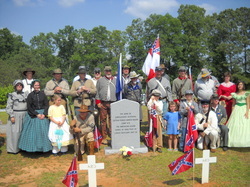 Shown here is a participants photo behind the Stringer's Confederate Headstones. 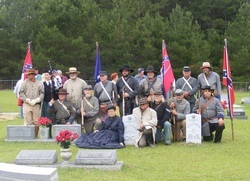 Camp #227 provided the Honor Guard at the Lauderdale Springs Memorial north of Meridian, MS. on Sunday April 24, 2011. Members of Camp #227 helped to make up the 27th Miss. Honor Guard at the Hattiesburg Memorial in downtown Hattiesburg next to the old courthouse on Friday April 22, 2011. The Jones County Rosin Heels SCV Camp #227 provided the honor guard, color guard and the firing squad for the Marion Cemetery Memorial north of Meridian, MS. on Sunday April 3, 2011. Camp #227 paid for this billboard located in Laurel on I-59 for Confederate Heritage Month in April of this year in our Lord 2011. 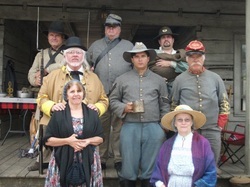 Rosin Heels Camp Members Don Green & Dennis Avera participated in the living history at Grand Gulf with the Crystal Springs Camp #712 on March 26-27, 2011. Members of Camp #227 help to form the firing squad at Routhland Plantation in Natchez, MS. as part of the Spring Pilgrimage Tour on Saturday March 12, 2011. 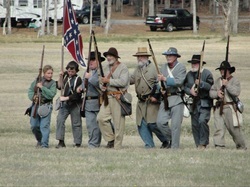 Members of Camp #227 take part in the Battles for the Texas Hospital Reenactment at Quitman, MS. held on Feb. 25-27, 2011. 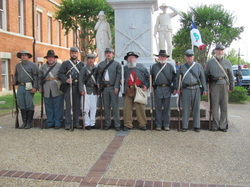 Member Don Green of SCV Camp #227 took part in the festivities at the Old Capitol in Montgomery, AL. on Saturday Feb. 19, 2011 as President Jefferson Davis was sworn in . 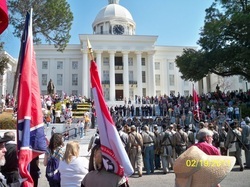 Members from many different SCV Camps in the Mississippi Division attended the Secession Event at the Old Courthouse in Vicksburg, MS. on Saturday Feb. 12, 2011. Members of Camp #227 form the 27th Miss. 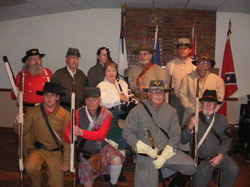 Honor Guard for the annual Lee-Jackson Banquet held on Jan. 29, 2011 at Bethlehem Baptist Church in Laurel, MS.